The attacks of 2001 are no longer the potent GOP rallying point they once were. Paul’s smirking get-a-load-of-this-guy dismissal of Christie’s ghoulish grandstanding is a nice final line for an important political chapter—-it’s the moment we knew for sure September 11 lost its currency in Republican politics. Paul wasn’t immediately booed, nor shredded by the moderators, nor condemned as a terrorist sympathizer or worse, as certainly would have been the case during the Bush years. In fact, in the Drudge Report’s insta-reaction online poll, Paul finished fifth and Christie was dead last. The eye-roll moment was a long time coming. It was foreshadowed in 2008 by the spectacular failure of Rudy Giuliani’s “Noun, Verb, 9/11” presidential campaign and John McCain’s subsequent failure to use his support for the surge in Iraq as a ticket to the White House. In 2010 and 2012 the wars in Iraq and Afghanistan were barely mentioned during national elections as concerns over the economy took center stage. And Thursday night proved that September 11 has finally been stripped of its potency as an animating event for Republican voters. The two biggest “Wait, who are they?” candidates in the 5 p.m. debate were George Pataki and Jim Gilmore, united only in irrelevance and the fact both were governors of states that were attacked on September 11. Like low-rent Hollywood producers trying to remake a franchise everyone’s already sick of, Pataki and Gilmore gamely tried to highlight that experience as a rationale for their candidacies. Few (if any) Republican voters appear to be impressed. The reasons for this transformation are pretty obvious: the joyless overuse of September 11 as a rallying cry by opportunistic politicians, and more importantly the disastrous overuse of the attacks as a rationale for bad foreign policy. The 150,000 American troops that were fanned out across Iraq when Cheney spoke at MSG, ostensibly as a response to September 11, have since withdrawn—-those that were lucky—-and many of them harbor grievous physical or mental injuries. ISIS has taken over much of the region and is more dangerous than anything we initially hoped to combat. Losing this terror trump card has created a (slightly) more serious foreign policy debate among Republicans. 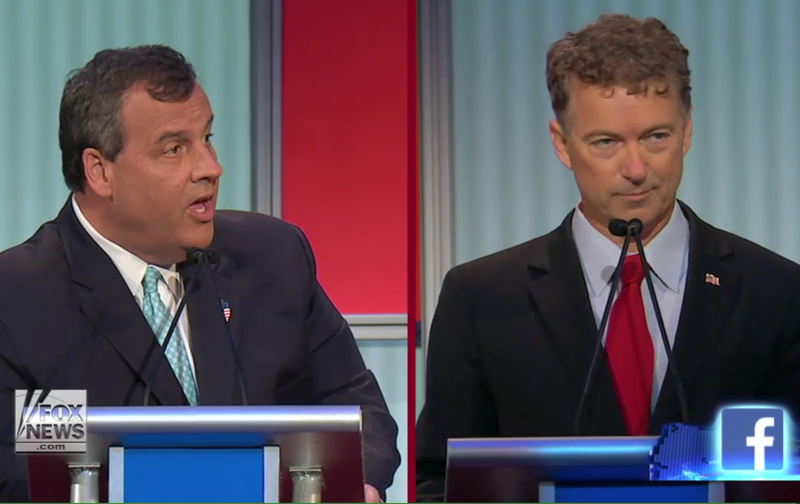 Paul scored some strong factual points on Christie during that exchange; when Christie advocated hoovering up all U.S. phone data because “how are you supposed to know” who is a terrorist and who isn’t, Paul rejoined with the obvious answer that warrants guaranteed by the Fourth Amendment are a pretty good way of discerning who ought to be targeted. Paul may not win the nomination, but his arguments reflect a growing segment of the Republican base, eye-rolls and all. After the debate, Sean Hannity—-who once wondered whether the country should “even be debating the Patriot Act and NSA wiretapping” during a 2006 interview with Cheney—-confronted Christie. “The original Patriot Act was never supposed to data mine American citizens. Only if they were connected to outside countries, people, and again, it went through the warrants,” Hannity informed him during a live interview. This change happened gradually, and is of course subject to change very quickly. But if you’re looking for an official end to a particular and dark chapter in American politics, it happened Thursday night in Cleveland.